You know that a healthy diet is essential for well-being, especially for the aging population – however, caregivers may not always have the finances, time, or physical ability to cook or drop off meals for your aging loved one. If you’re worried your loved one isn’t getting a regular healthy home cooked meal, a meal delivery service could be an option to ensure their nutritional needs are being met. When it comes to finding a local food service for you or your elderly loved one, there are several options available. First, check your postal code to see if you have a local Meals on Wheels program. They offer free meals in a communal setting – if leaving the house is an option for your loved one – or will deliver a hot meal to their home. You can also check in with your local community center or church group to see if they offer some sort of meal service for elderly community members. Another resource is your local Area Agency on Aging. 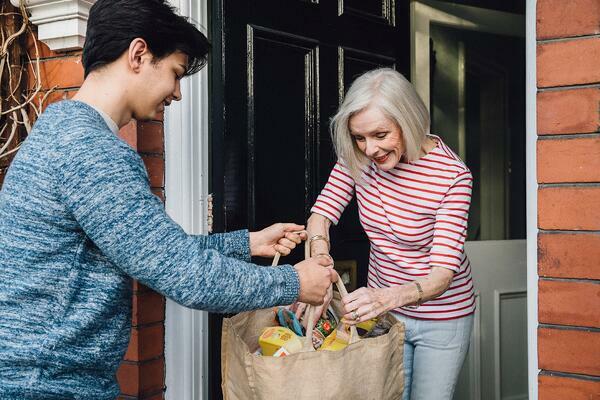 They can help connect seniors with local nonprofits offering meal delivery and other food services – many of which are often free or low-cost. Another option is Personal Chef to Go. This program has a meal plan for different preferences and lifestyle needs, and boasts weekly or biweekly delivery services. You might also consider hiring a personal chef to come into the home on a weekly or biweekly basis to cook large batches or meals for portioning throughout the week or month. This type of service can be costly, but the benefits of healthy, fresh meals customized to your loved one’s tastes and specific dietary needs can’t be overlooked. Plus, your loved one might enjoy chatting with their personal chef while they prepare meals. If your loved one is still able and interested in cooking, or doesn’t qualify for other services, there are meal delivery companies such as Blue Apron, Hello Fresh, or Chef’s Plate that are excellent choices. They provide all the necessary ingredients to cook delicious and nutritious meals at home, with a menu that changes weekly so your loved one won’t get bored of eating the same foods over and over. You’ll want to consider if there’s room in the budget for these types of services. In general, you can expect to pay around $10/serving for these options. Finally, there are even senior-focused meal delivery services available. Silver Cuisine by bistroMD includes meals that have been designed with seniors in mind, as does Magic Kitchen. Meals are created by a dietitian with senior-specific needs in mind, such as weight gain and diabetes, and are easy to reheat in the microwave or oven. Costs range from $5-$15 for these ready-made meal services. The most obvious benefit of food services for the elderly is the fact that the person is receiving a fresh, nutritious, and often hot meal at least once a day. Often, if an elderly person is housebound or in poor health, it can be a challenge to get out to the grocery store and/or cook on a regular basis. A meal delivery service can help relieve this burden. There is also a high population of older adults who face food insecurity on a regular basis – more than 4 million by some estimates. The National Foundation to End Senior Hunger estimates that approximately 1 in 7 seniors are affected by hunger at some point, with the American Academy of Family Physicians estimating that there are nearly 4 million malnourished seniors in the U.S. today. Ensuring every person has at least one healthy meal a day can help combat food insecurity and the associated health issues. Another benefit of food services for the elderly are that they offer some level of social interaction. Community meal programs provide the most opportunities for regular social interaction, allowing your loved one to enjoy meals in the company of others. Budget. This will often determine what types of programs you’ll access. Any dietary needs. Special requirements often cannot be accommodated with free community drop-in type programs. Physical needs. Can your loved one still chew and swallow without difficulty? Health. Are they able to get out of the house or are they homebound? Can they cook safely without supervision? Qualification criteria and guidelines for food services for the elderly vary from state to state and program to program. Generally speaking, for subsidized or government-funded programs, proof of income is required. Your local Area Agency on Aging can help connect you with local food service programs – many of which are often free or low-cost – and can explain the qualifying criteria and even sometimes help with applications.